HPV vaccination is working very well and is extremely safe and the WHO, as well as a number of governments, has recommended that it is given to all girls and young women. 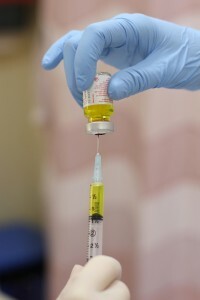 Since its introduction in 2007, it has been taken up by many countries who have introduced national programs for vaccination, usually through schools. The vaccine has a very good safety record and has been given to millions of people already. It is made up of just one of the proteins from the outer coat of each of the virus types included. The protein is produced artificially so the vaccine contains pure protein rather than other parts of the virus making it very safe. The vaccine is very effective at preventing infection but it is not effective for women who already have infection. Since the vaccine gives better levels of protecting antibodies than a natural infection with the virus, it helps to prevent a second infection with the same virus. Studies so far suggest that protection will last for at least 10 years and possibly longer. The vaccine is usually given to young girls but older women can benefit from vaccination and the vaccines have approval for use in women beyond teenage years. Although the vaccine protects against the two most common cancer causing virus types, studies suggest that a degree of cross protection occurs against other virus types. The vaccination involves three injections spaced out over 6 months. No adverse effects have been linked with the vaccine apart from discomfort at the injection site and mild flu like symptoms. Angus McIndoe has over 20 years experience in the NHS and Private sectors to call on. He is one of the foremost UK consultants working in the field of Gynaecological Oncology and was one of the first RCOG accredited gynaecological oncologists in the UK. He also carries out robotic surgery at the Wellington Hospital in London. Angus is a fully accredited colposcopist by the BSCCP/RCOG combined programme and an expert in dealing with abnormal smears. He runs a rapid assessment service in Harley Street with Professor Tom Bourne for women with symptoms or worries that they may have gynaecological cancer. This entry was posted in Diagnosis, Diagnosis and treatment, New research, News and tagged Cervical smear, cervix, HPV, smear. Bookmark the permalink.